THOR shows U.S. and British bombing raids from 1939 to 1945. Red squares are B-17s, black squares are B-24s, and yellow circles are B-26s. Pink circles are B-25s, and purple circles are RAF Wellingtons. You can track every bomb that the U.S. dropped in World War I, World War II and Vietnam now that part of an Air Force database is accessible to the general public. The Theater History of Operations Reports, or THOR, details about 15 million American and allied aircraft sorties, according to the Air University at Maxwell Air Force Base, Ala. Records from the Korean War are currently being digitized and added to the site. 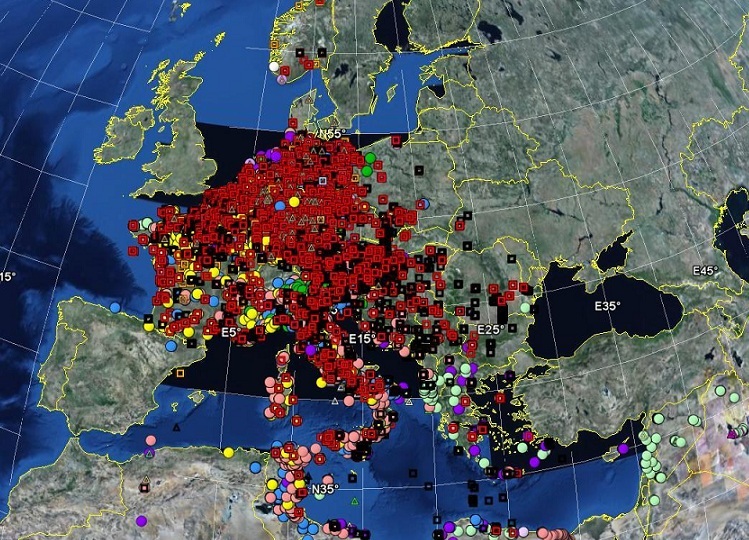 THOR allows you to see not only a list of airstrikes, but also to plot the bombing raids on Google Earth and see videos of the progression of air campaigns. The data on bombing raids have already saved lives in countries dealing with unexploded U.S. ordnance from previous wars, said Lt. Col. Jenns Robertson, who created the database. Robertson has spent close to eight years creating a comprehensive database of U.S. airpower since World War I. Records of airstrikes from the Persian Gulf War, Iraq and Afghanistan are still classified, so they are not available to the public. The historical data shows the scale of U.S. bombing during World War II was much bigger than is commonly understood, Robertson said. “We were blown away – no pun intended – by the level of bombing that was taking place, not only in the South Pacific but also in Burma, which is something that nobody looks at; Formosa, currently known as Taiwan; and the Philippines – how heavily those regions were bombed in the lead-up to bombing Japan proper,” he said. What Robertson hopes people take away from the website is there are more heroes than the public knows about. “To see the stories of these airmen and what they went through and how they persevered against all the elements – I think is a lost story that the American public should know about,” he said.